Adventure racing can involve some pretty extreme circumstances, but sometimes it’s the least expected that pose the greatest threat. 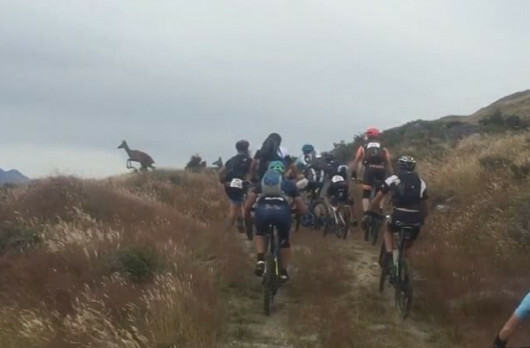 During an adventure race in New Zealand, a herd of stampeding deer nearly steamrolled a group of mountain bikers. The riders were taking part in the Red Bull Defiance adventure race, known the world over as one of the premier multi-sport endurance races. The two day race takes competitors on a 39 mile mountain bike, 24 mile run, 25 mile kayak and 60 meters of rappelling. But nothing to prepare them for a herd of stampeding deer. The event was captured as a bunch of teams were climbing a section of the course together. Lucky that nobody was taken out. Adam Wilson captured the following video from his Instagram account. He told One News in New Zealand that they all felt really lucky. “Just a really close call. They just kept coming, there were some many of them, it was a full stampede,” Wilson said.